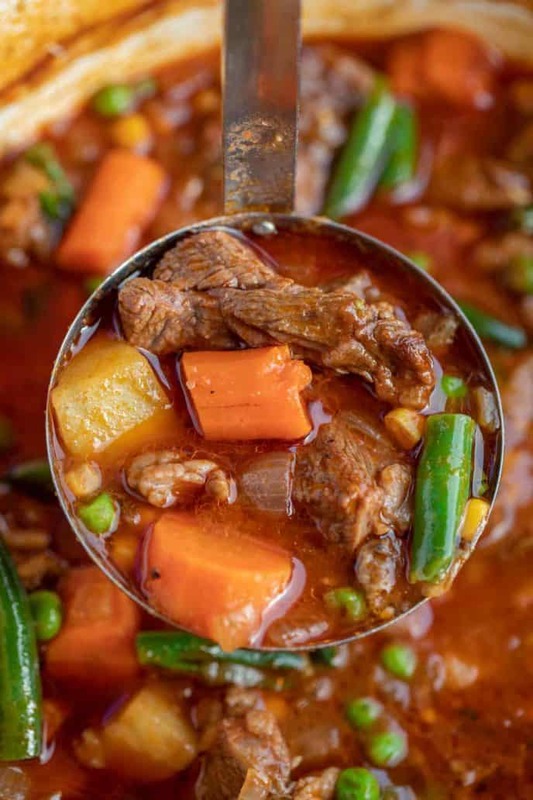 Vegetable Beef Stew is the PERFECT combo of tender beef and fresh veggies in a savory beefy tomato base, that’s full of vegetables, rich flavors, easy to make and in just one pot! Classic slow cooked beef recipes with a chuck roast scream winter comfort food to me including Ultimate Slow Cooker Pot Roast, Ultimate Slow Cooker Beef Stew, and Slow Cooker Vegetable Beef Soup. Vegetable Beef Stew is one of my favorite one-pot stew recipes to make on the weekends. You need a few hours to make this recipe, but trust me, it’s worth it. You can make it ahead and freeze leftovers, but my family always tells me that this is better the next day. Plus your kitchen will smell amazing for the entire time you’re cooking it! 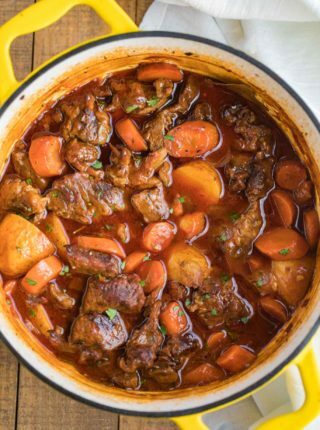 You can even make this stew on your stovetop if you’d like. You’ll have to keep an extra box of beef stock next to the stove and watch for the level of liquid to be sure it doesn’t go too dry, but the smells in your house will make you so happy you’ll be so excited to eat. Grab a fresh baked French bread or Perfectly Easy Dinner Rolls to enjoy this amazing stew! 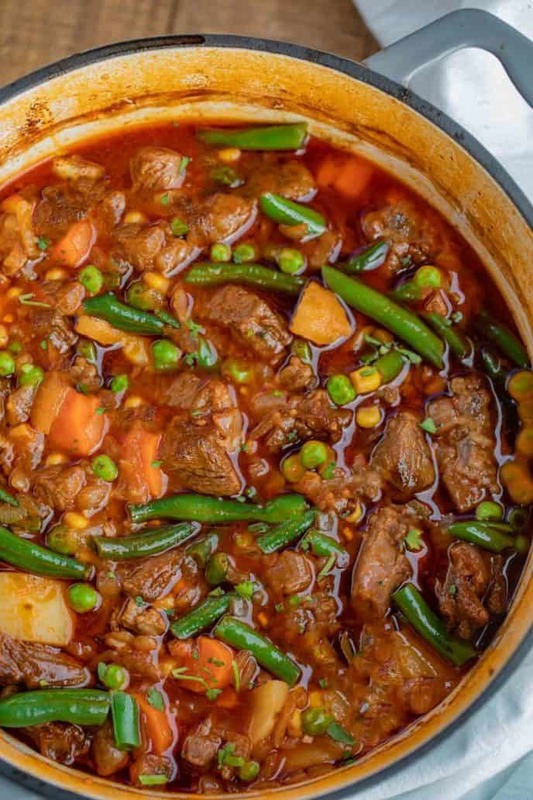 HOW DO YOU MAKE VEGETABLE BEEF STEW TENDER? There are two parts of this recipe that will make sure your meat is as tender as possible. The first is coating the beef with flour and browning it on all sides, which helps lock in the juices from the meat. The second part is covering the and letting it slowly cook in the oven. This beef stew needs the full amount of time to let the stew meat tenderize properly. 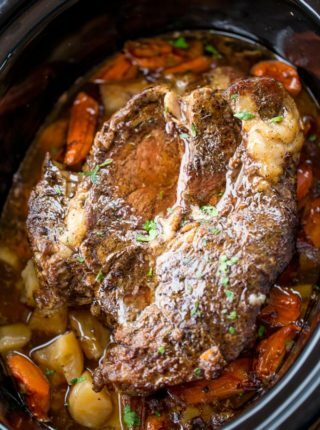 You can of course also keep the entire piece of beef whole and create this recipe to be more like a vegetable beef pot roast (like the super popular Ultimate Pot Roast on my site or the Red Wine Pot Roast). 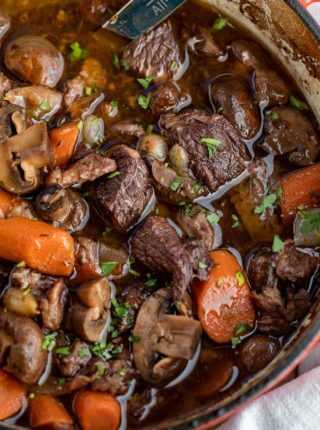 This will require a slightly larger dutch oven but trust me when that pot roast is fork tender and falling apart you will LOVE the recipe so much you won’t mind the slightly larger pot in the sink. Remember too, one of the best things you can do for a beef stew is give the beef a good, solid sear on the meat before you braise it. The better the sear the better and deeper the flavors you are creating and the better the textures of the stew. 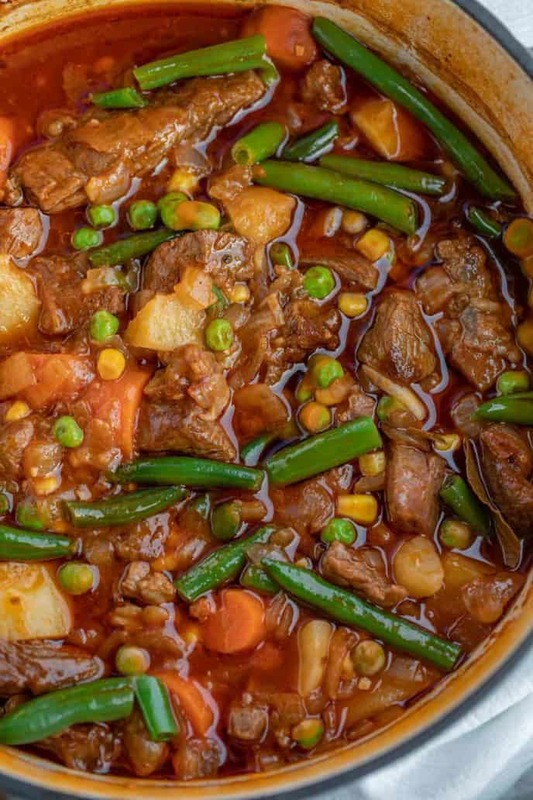 CAN VEGETABLE BEEF STEW BE FROZEN? Vegetable beef stew is the perfect recipe to make-ahead, and can be frozen when tightly sealed for 3-4 months. If you’re making this beef stew recipe ahead of time to freeze for later, I recommend waiting until it is almost done to add the potatoes, so they are only just cooked. This way they won’t over cook when you reheat it. Move it to the refrigerator the day before, then add to a pot over medium-low heat until it reaches the desired temperature. 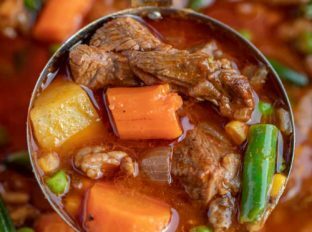 WHAT OTHER VEGGIES CAN I ADD TO VEGETABLE BEEF STEW? In a large sauté pan, melt butter with canola oil. Dredge the meat in the flour, salt, and pepper. Brown on all sides, then move to the pot. Add all other ingredients and gently stir together. Cook on high for 4 hours, or on low for 8 hours. I recommend cooking this on low, because it gives the flavors more of a chance to develop, and the meat to get really tender. Turn on the sauté function and add oil and butter. Add the stew meat until browned on all sides. Work in batches, leaving room between each piece. Remove and set aside. Add onions and seasoning, cooking until soft. Add all other ingredients to the instant pot, stirring gently. Add the beef, then close the lid and pressure valve. Set on manual for 10 minutes on high. Let the pot naturally release, and serve. For more flavor, you can deglaze the onions with 1/4 cup of red wine. Use a red wine that you would also like to drink. The golden rule is if you won’t drink it, don’t cook with it. Personally, if I add red wine, I usually choose a dry one for this recipe. When browning the stew meat, leave room between each piece to make sure you get a really nice sear on all sides. This locks in the juice and also adds a lot of flavor to the meat. If you’re making this in the slow cooker, use a liner bag to make cleanup really easy! Serve this beef with a glass of red wine, garlic bread, cornbread, or a classic wedge salad. This stew is crazy delicious. It’s nothing but YUM! I can’t tell you how much I wish this was coming out of my oven right now! I want it for dinner! As would my whole family. Looks so hearty and delicious! 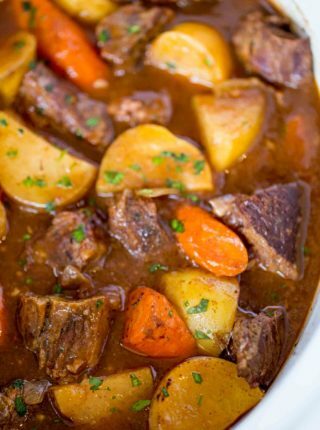 This beef stew is so delicious and full of flavor! I made it last weekend and it was a huge hit. I expected to have left overs. But didnt! so good! I’d call that a winner for sure! Thanks for coming back to let me know. Yes! This is just what we need for this icy weather we have today and tomorrow! Just looking at it warms me up! I love this recipe Sabrina! However, being Aussie I also add a dessertspoon of vegemite! !